The first season of this intoxicating and addicting British drama series is now available on DVD. 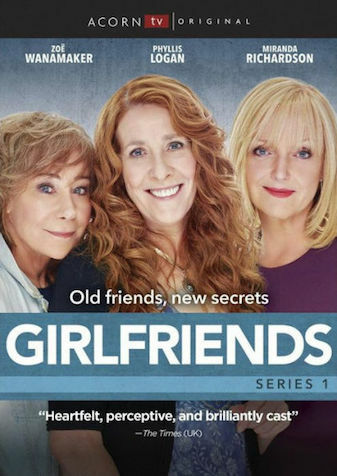 Girlfriends stars Phyllis Logan, Miranda Richardson, and Zoe Wanamaker as best friends who manage to get into a lot of drama through each of the six episodes in this season. It’s like a train wreck of situations, each more dramatic than the others. And, like a train wreck, you can’t stop watching! The season starts and ends on a cruise ship. In the opening episode Linda (Logan) and her husband are celebrating an anniversary. But soon her husband falls overboard leaving no trace and leaving Linda alone to cope with the tragedy. Sue (Richardson) learns her business partner and ex, not to mention father of her son, is replacing her in their bridal magazine. It’s age discrimination, pure and simple. And Gail (Wanamaker) is separating from her husband. She lives in her house with her mother who has dementia, her son who is out on probation, and his young son. To say she has her hands full is an understatement, but she doesn’t complain. The three women see each other through all the ups and downs of life – together. Whether it’s propping one of them up when her husband dies, or encouraging one of them in a tough business decision, they have each other’s backs. It’s nonstop drama as these “senior” women prove that youth isn’t always the best time in life. There’s something to be said for experience. Yet, those experiences add up to some pretty weird and often humorous situations. They are parents and grandparents, and they have arthritis, need glasses to read, and want to be appreciated. That’s the bottom line. It is the love and appreciation of each other that sees them through all their tragedies, and yes, adds to their triumphs. These three amazing actors are not new to American viewers. Phyllis Logan was Mrs. Hughes in the popular PBS series Downton Abbey. Miranda Richardson was Clemmie Churchill in the film Churchill and Rita Skeeter in the film Harry Potter and the Goblet of Fire, to name just a couple roles. And Zoe Wanamaker was Princess Marie in Mr. Selfridge. Bonus features on the DVD include a behind the scenes look at the series and a featurette with the cast talking about their characters and the show. Girlfriends is a fun British drama with plenty of meat and potatoes, or should I say shepherds pie and chips? It’s for adults only as the content is not child-friendly.